The government is likely to send this week a Presidential reference to the Supreme Court for conducting a probe into the allegation of sexual harassment against Justice (retd) A K Ganguly after the attorney general has endorsed it. 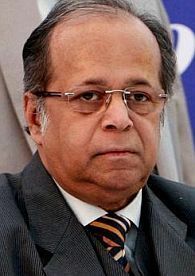 The Union home ministry is expected to place a note, for sending a Presidential reference, in the next meeting of the Union Cabinet incorporating the views of Attorney General G E Vahanvati, who has noted that a case can be made out against Ganguly following allegations of "unwelcome behaviour" towards a woman law intern. Sources said once the Cabinet clears the proposal, it will be sent to President Pranab Mukherjee for approval. The MHA then will send the Presidential reference to Chief Justice of India for conducting a fresh probe into the whole incident. The government is expected to take the initiative after the Supreme Court meets this week after a winter break. The attorney general's suggestions came after his views were sought on a letter to the President by West Bengal Chief Minister Mamata Banerjee seeking Ganguly's removal from chairmanship of West Bengal Human Rights Commission following a woman law intern's allegation of sexual harassment against the former judge. Justice Ganguly has strongly denied the charge and refused to quit his post. Sources said the attorney general had been asked to give views on whether any case can be made out on three issues -- the allegation of sexual harassment against Ganguly, his visit to Pakistan without informing the West Bengal government and taking an assignment from All India Football Federation despite holding the high post of human rights commission. The Protection of Human Rights Act is clear that a chairperson or member of the NHRC or a state human rights commission can only be removed "by order of the President of India on the grounds of proven misbehaviour or incapacity after the Supreme Court, on reference being made to it by the President, has, on enquiry...reported that the chairperson or the member, as the case may be, ought on any such ground to be removed."